The hottest 2019 trends from one of the best homebuilders in Greensboro. If you’re planning to build a custom home in 2019, you’ll want to include all the latest features and design elements. 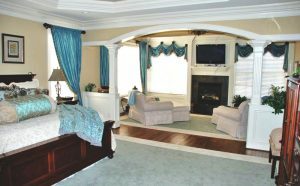 Elite homebuilders in Greensboro follow these trends and can recommend the newest custom home designs for the upcoming year. Make sure your new home is state of the art by working with R&K Custom Homes to incorporate some of the biggest trends of 2019. One room where design trends are always rapidly changing is the kitchen. By the time you build a kitchen, it’s already out of date. Get ahead of the game with some of these kitchen features. No Upper Cabinets. What? But where will I store all my stuff? Enter, the minimalist. Home designs are trending toward minimalism and decluttering. Pear down your possessions to the things you really need. This is not just a trend for small urban apartments; it’s happening everywhere. Lower storage cabinets are for your small appliances, pots and pans, and other odds and ends. Open shelving is the new form of vertical storage, showcasing big items like colorful bowls, canisters, and pottery. Black and Bold Colored Appliances. Stainless steel is out, I’m afraid. Black appliances are coming back and bright colored retro-style appliances are in. Stoves, ovens, refrigerators, and more are available in bold colors to make a definitive statement in your kitchen. Elaborate sinks. Another area where stainless steel is long gone and even porcelain is old news. Brass, gold, silver, and other bold medals in hammered and elaborate finishes are replacing the old trend, turning functional elements into style elements. We also spend a lot of time in the bathroom, and style trends are ever-changing in these essential rooms. Homebuilders in Greensboro are incorporating some of the same design elements from the kitchen in bathrooms. Fancy Metal Sinks. The hammered metal sinks that are popular in kitchens are also present in bathrooms with similar finishes and designs in the bowl itself as well as faucets and handles. Bold Glass Shower Doors. The shower stalls of 2019 will no longer be clear as geometric patterns and colored glass take effect, giving ordinary bathroom features an extraordinary new look. Some designs aren’t relegated to just one room of the home. There are color pallets, tones, and textures that can be woven into any room. Shades of Blue. Blue is in in a variety of shades. Paint a wall, an entire room, or just add a blue accent rug. Bright Colors. Black and white and neutral colors are being replaced with bold, even primary colors used in combination. Paint, appliances, accessories, and furniture are adding a vibrant element to interior décor. Brass Accents. Brass is coming back in variety of ways, such as light fixtures, furniture, sinks, hardware, and accent pieces. Do you want your new custom home to be on the cutting edge of structural and interior design? The top home builders in Greensboro, such as R&K Custom Homes, stay up to date with current home trends. Build with R&K and get a jump start on 2019 designs. Call for a free consultation: (336) 643-3505.